The escape scenes were filmed in Swain County and neighboring Dillsboro, where the spectacular train wreck was produced with the assistance of the Great Smoky Mountains Railroad. 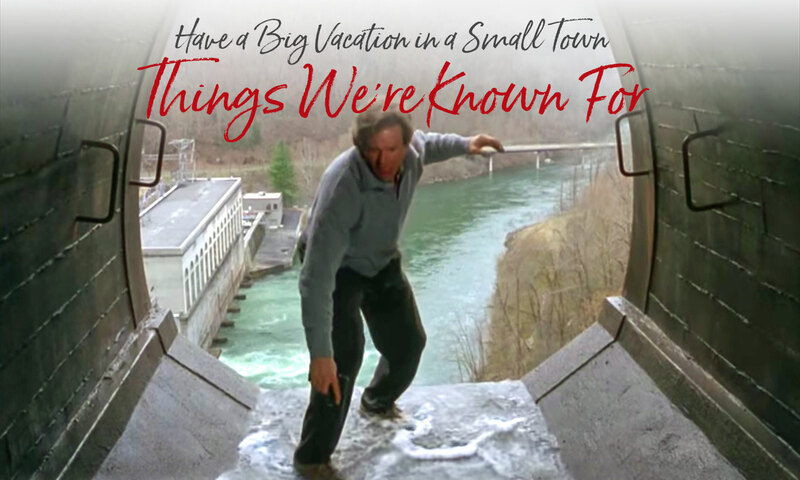 And when Harrison Ford jumped off the dam, it was the Cheoah Dam at the western tip of Swain County. You can find numerous connections to the Bryson city area on library shelves, as well as the music and DVD sections — a great way to experience the area from an easy chair. Take a literary tour of the Bryson City Cemetery, the Bryson City Tales / Larrimore tour, or a historical stroll through town. Bryson City Tales: Stories of a Doctor’s First Year of Practice in the Smoky Mountains by Dr. Walter Larimore, (former) Swain County physician, is one of three books in a series on his life of a small town doctor in Bryson City. The other titles are Bryson City Seasons: More Tales of a Doctor’s Practice in the Smoky Mountains; and Bryson City Secrets: Even More Tales of a Small Town Doctor in the Smoky Mountains. He has also written Hazel Creek: A Novel, which is about a family in the 1920s who lived on what is now the North Shore of Fontana Lake. Take the Larimore tour around Bryson City. Jim Parham and Mary Ellen Hammond have written several outdoor adventure guide books. These included Off the Beaten Track: Western NC Smokies, Natural Adventures in the Mountains of Western North Carolina, and Road Bike the Smokies:16 Great Rides in North Carolina’s Great Smoky Mountains. A Bridge of Doom: The Hostage Price; Asgent of the Dark One; Enchanter’s Lot by Kurt Paul Hotelling. Hotelling has written fantasy and science fiction for over thirty years. He is also a bandmaster teaching Native American students on the Qualla Boundary. Thirteen Moons by Charles Frazier. Near the end of his life, frontiersman Will Cooper reflects on his formative experiences managing a trading post in the Cherokee Nation. He is adopted into the tribe. When the Cherokees are displaced to Oklahoma, he takes up their cause and lobbies at the national capital. Murder at Fontana Dam by Dennis Ackison. America is in the middle of World War II. A young man has graduated from law school in West Virginia and ended up in a little town in the mountains of North Carolina to start his law practice. Little does he know that his life is about to change forever when a grieving mother begs him to look for her missing boy. Look Homeward, Angel by Thomas Wolfe. The angel statue carved from Italian marble by Wolfe’s father and mentioned in the book is believed to be in the Bryson City Cemetery. Inspirational Lyrics is a collection of 50 gospel song lyrics written by Bryson City native Sharon Wyatt. The lyrics can be set to any tune a congregation wants to use. Published by The Sylva Herald. Blue Willow Dishes, Recipes and Remembrances by Sue Hyde. This is a collection of recipes and stories from the Hyde family and the Historic Calhoun Country Inn. Sue has also compiled a second cookbook Gone Full Circle Volume One: More Recipes and Remembrances. Leroy Sossaman, a Bryson City businessman also wrote poetry. Here are a few: All Things Man-Made Shall Pass Away, This Verse Will Fade, as I One Day … but Mountains are Forever; These My Mountains; This My Land: Poet’s Life-Long Love-Affair With the Southern Appalachians; Falling Sky; and Backside of Heaven. Along the River: People and Places by Duane Oliver. A collection of photographs of people and places once found along the Little Tennessee River, an area now part of the Fontana Lake Basin and southern edge of the Great Smoky Mountain National Park. Swain County; Early History and Educational Development, by Lillian Franklin Thomasson, (former) Swain County schoolteacher. Bryson City, N.C. Centennial. 100 Years of Progress, 1889-1989. Bryson City, Capital of Swain County, N.C. A centennial book about a unique county compiled and edited by the centennial committee of Lillian F. Thomasson, Bruce MacMurray, Peter Lawson, and R. L. Lyday. Marriages of Swain County from 1871 through 1905 by Elise Jones Bryson. The Heritage of Swain County, North Carolina, 1988. Hazel C. Jenkins, coordinator and Ora, family history editor created this book. The Fugitive starring Harrison Ford and Tommy Lee Jones. Local scenes include the train wreck (Great Smoky Mountains Railroad location near Dillsboro); Cheoah Dam, Bryson City and Sylva locations. The 60-second train wreck scene took 10 weeks to plan, four days to shoot, and only one take to make it happen. My Fellow Americans starring James Garner and Jack Lemmon. The Royal Palm Crown Coach and a baggage car from the Great Smoky Mountains Railroad (headquartered in Bryson City) were used in the film. Nell starring Jody Foster, Liam Neeson and Natasha Richardson. Filmed at a cabin constructed on the shore of Fontana Lake, and at various locations in Robbinsville. Digging to China starring Kevin Bacon and Evan Rachel Wood. Directed by Timothy Hutton. Filmed in Cherokee at Mac’s Indian Village and other locations. Hiking on Hazel Creek. Award winning cinematographer Ron Ruehl tags along with Lance Holland on a hike to give you an unedited armchair journey into the vast North Shore section of the Great Smoky Mountains National Park. Out of print. Marshall Grant (1928-2011). Born just outside Bryson City, Marshall began playing guitar at age 10. He played standup bass in Johnny Cash’s original trio and helped create the legendary singer’s distinctive rhythmic sound in the 1950s. He served as Cash’s road manager for almost three decades. He wrote the book “I Was There When It Happened: My Life With Johnny Cash.” (pictured Luther Perkins, Johnny Cash & Marshall Grant. photo: Southern Folklore Collection). International Bluegrass Music Association Hall of Fame Member Arthur Lee “Red” Smiley is buried in the DeHart Cemetery in the Jackson Line Community just west of Bryson City. Red’s tombstone is a striking one, engraved with a guitar. Born in the Asheville area, Red was the grandson of John S. Smiley, a noted figure in Swain County history. Red was a pioneer in bringing bluegrass to television, performing more than 3,000 weekday broadcasts 1956-1968 on “Top O’ the Morning”, the first early morning country music TV show. Rhonda Vincent “You Gotta Start Somewhere” music video. The video, filmed in Bryson City showcases the beauty of early spring in the Smoky Mountains. Locations featured Lands Creek Cabins, Clampitt Hardware, and Great Smoky Mountains Railroad. Horace Kephart See story elsewhere on this page. Mark Cathey. Hands down the finest hunter and the most adroit fisherman yet produced in the Smokies region. And he is equally renowned as a colorful character. Eyes light up with warmth and humor when “Uncle Mark” stories are being told. 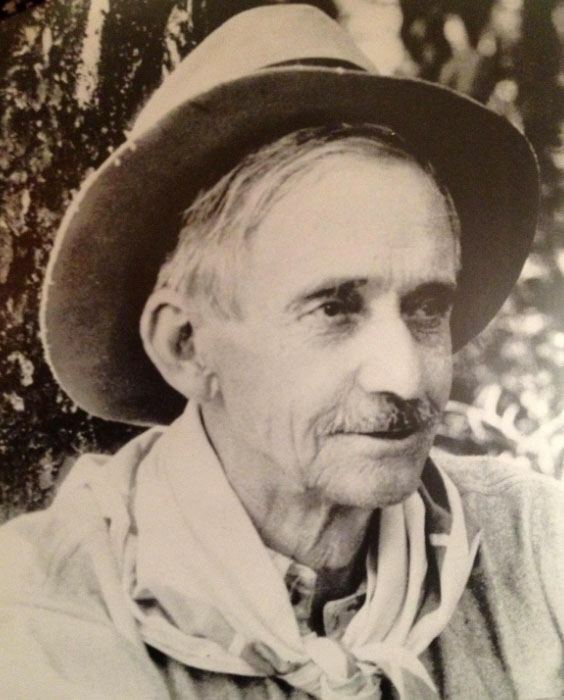 Born in 1871, he lived most of his life around Indian Creek Falls in the present day Great Smoky Mountains National Park about four miles north of Bryson City. George Ellison, North Carolina naturalist, writer and historian who has taught Smokies lore for many years, has been named one of the 100 most influential people in the history of the Great Smoky Mountains National Park. The 2016 honor came from the Great Smoky Mountains Association in celebration of the 100th Anniversary of the birth of the National Park Service. George has contributed to republications of two Appalachian classics: Our Southern Highlanders and History, Myths, and Sacred Formulas of the Cherokee. 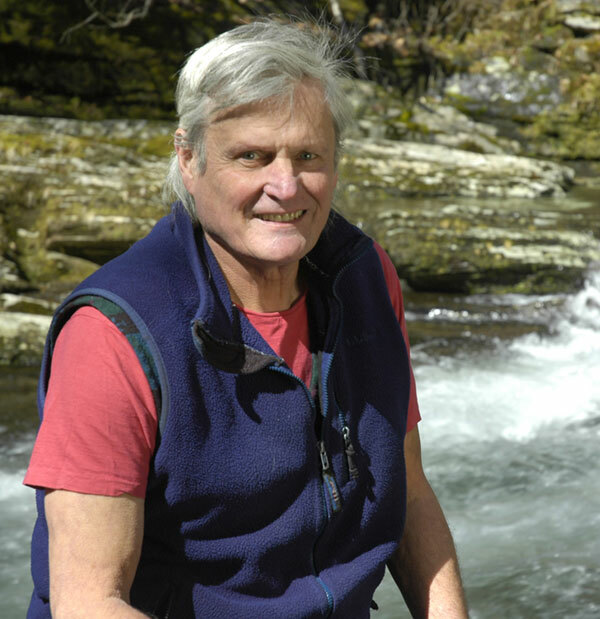 He has also written numerous books, essays and poems about the Smokies. 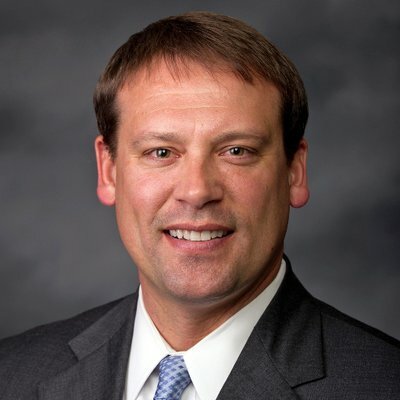 Heath Shuler, a native of Swain County, represented North Carolina’s 11th US Congressional District from 2007-2013. He is successful entrepreneur and small business owner. As a student-athlete at Swain County High School, he led the Maroon Devils to three North Carolina state championships and was named North Carolina High School Player of the Year. From Swain County, it was a short trip over the Great Smoky Mountains to the University of Tennessee. While at UT, he set numerous passing records, was selected to multiple All-America teams, was named Southeastern Conference Player of the Year and NCAA Male Athlete of the Year, and was the runner-up for the Heisman Trophy. He went on to play in the National Football League for the Washington Redskins, the New Orleans Saints, and the Oakland Raiders before an injury ended his football career. Franklin Paul Rogers, born in Bryson City in 1905, was an American tattoo artist. He trained under Cap Coleman in Norfolk, Virginia from 1945-1950. He designed tattoo machines, which he called “irons”, a term he coined that is used in the industry. In his early life, he was in the traveling circus. Horace Kephart was born in 1862 in Pennsylvania. Trained as a librarian, Kephart achieved national recognition as director of the Mercantile Library in St. Louis. While there he began indulging in camping and hunting trips, and to write articles about this new passion. Eventually he succumbed to what he later called “nervous exhaustion” and left his home and family and moved to Western North Carolina at the age of 42. He chose a simple lifestyle and took an immediate interest in the history and culture of the people. He was an astute observer of people as well as a voracious reader. During his lifetime, Kephart emerged as a recognized authority on the cultural and natural history of the region. He became especially renowned for his classic books Our Southern Highlanders and Camping and Woodcraft. Kephart, who was personally modest and rarely sought the limelight, nevertheless used his abilities and reputation on behalf of the movement to create the Great Smoky Mountains National Park. In recognition of his efforts, U.S. Geological Board recognized Kephart’s contribution by naming a peak within the park Mount Kephart, an honor previously bestowed only after an individual’s death. He died in 1931 before the Park became a reality. He is buried in the Bryson City Cemetery. In 2009, a manuscript of a his only work of fiction – Smoky Mountain Magic – was presented by the Kephart family to the Smoky Mountains History Association to be published for the first time. More on Horace Kephart’s Smoky Mountain Magic. Material reference: Western Carolina University Library Archives.